MooMama: Only 63 Days Left! 63 days until Halloween arrives again! I know it isn't quite September but it has not stopped my dreaming of the brisk autumn days and nights of October! When my 6 brothers and sisters and I were growing up, we never trick-or-treated. 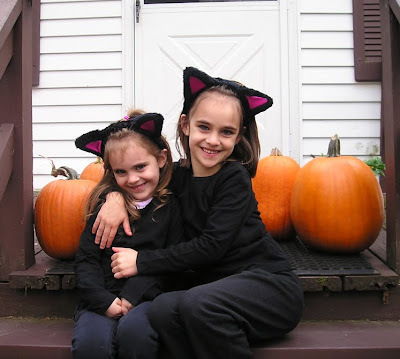 We still plotted to create the perfect costume and we would trek through the barely lit streets to my Grandmothers' homes, spotting children creeping about with their bags stuffed full of candy! At each stop, we would get a treat! I still remember my Grandma's popcorn balls (which I'm not sure we actually ate) and one or two candies from the basket at my Mommom's before heading back home for pumpkin pie! After the arrival of my own little ones, I decided to hold Halloween parties at our home to create new traditions! Another tradition I am hoping to return to this year are handmade costumes. In the top picture, I was a Monarch butterfly, a wonderful childhood memory for me. I remember my Dad cutting out the wings and the smell of the Tempera poster paint as I helped paint it! I remember dressing for the parade at school and the teachers complimenting my handiwork! My heart was fluttering as fast as a butterfly's wings that day! I loved that costume! I have strayed from my handmade costumes for the girls in recent years. Disney Princesses and High School Musical characters secretly snuck into the mix but this year we are getting back to old school costumes! Madelyn wants to be a devil, Lana a vampire, and Sophia, as of today, wants to be a pirate! (Arrrgh!) I have matching glow-in-the-dark skeleton pajamas for the twins so they will be ready for Halloween AND for bed! 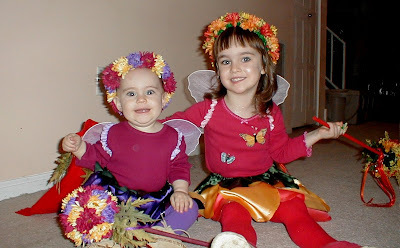 Lana and Madelyn as Woodland Fairies. 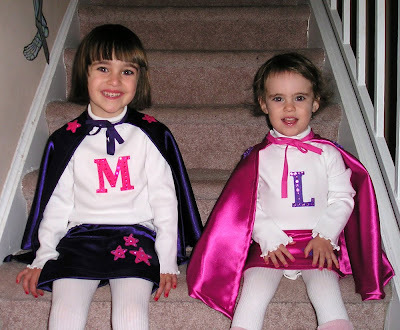 Madelyn and Lana as Super Heroes! Made the capes and skirts. Customized plain white shirts with their initials, ironed on felt stars and glued on rhinestones! My husband as Clark Kent! 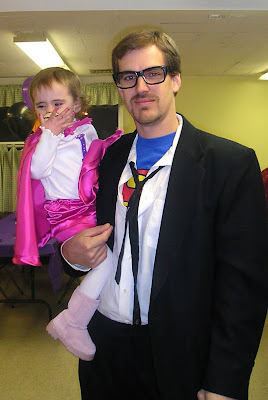 Superman shirt under a suit and a pair of cheap glasses! Love your costumes! I used to have wonderful ideas of making the kids costumes, but that doesn't always happen. We create some adorable cowpoke costumes one year (maybe Maddie, my horse fan, was a cowgirl twice? ), but mainly I buy 90%-off costumes after Halloween and let the kids pick from those the next year. Last year, Ryan insisted he needed to be Zorro (where do they get the ideas?) - and we thankfully found a 50%-off costume at one of those terrible Halloween Supply Stores that pop up in the fall. I guess it's time to start thinking about Halloween again. Maddie has mentioned horses yet again - and since she wants to start riding this fall, I suggested perhaps she go as an equestrian. Ryan doesn't have any ideas yet, but Jacob wants to be Jack Sparrow. Thanks for sharing your costume ideas. I am about to take a sewing course and one of the reasons why is so that I can sew costumes for my kids. Are there really only 63 days left? My class ends on Nov. 4th - I hope I have learned enough by Halloween to put something together! Hi there, I just popped by to have a read and tell you I love your blog. I`m currently waiting for my number 5 to spring into action. She`s 4 days overdue now and I`m not happy. I don`t have much patience during this time, as I`ve gone over with every one of them. I`ll be reading more of your blog later. I love Halloween, such fun to get dressed up and pretend. Cute pictures all of them, but I love the first one of you and your siblings. The butterfly wings are beautiful! i love it! thanks for sharing the photos!